A number of promotions from a selection of our Preferred Partners are now available to GolfBC cardholders! (Not a cardholder? Click here to find out how to get your FREE card!) Please note that any package booked through a third party is NOT eligible for GolfBC points. BCAA Members Save at GolfBC! BCAA Members save 10% on Green Fees, Clothing and Accessories! 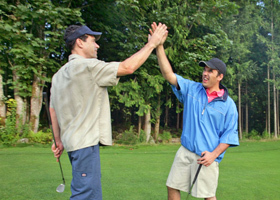 Entertain clients, reward business associates and employees, and much more with these flexible golf passes! GolfBC's Orange Tees help make golf more accessible and fun! GolfBC will Meet or Beat our Competitor's Prices! Let us prove that our prices on current models of golf clubs and golf shoes are the best in town!